Welcome to the blog! Here you can read reviews of films available in the Nipissing Library. Maybe you'll know some of them, maybe you won't. But you'll be surprised what you can find if you know where to look. Last week, Sidney Lumet died. I don’t expect you to know who that is, so I’ll catch you up by telling you that he was a director, and who directed my favourite film 12 Angry Men. 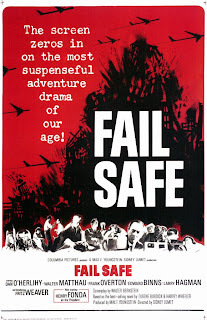 Since there are few things in the world that make us more reflective than death, and because I knew no other films of his outside of my favourite, I decided to write my final film review about one of Sidney Lumet’s other great and critically acclaimed films, Fail-Safe. Fail-Safe takes place in the sixties, when the Cold War is anything but cool and tensions are running high between the Americans and the Soviets. When a computer malfunction sends a squadron of fighter planes on an unauthorized and irretrievable bombing mission towards Moscow, the President and his team of officers must find a way to convince the Soviet leader that it is an accident and not to return fire. But for the Americans, this means helping their enemies to shoot down their own planes. Can the Soviets successfully stop the planes from reaching Moscow? Can the President convince the leader that it was a mistake? And what is he prepared to do if the planes reach their target? The answer isn’t what you might think. 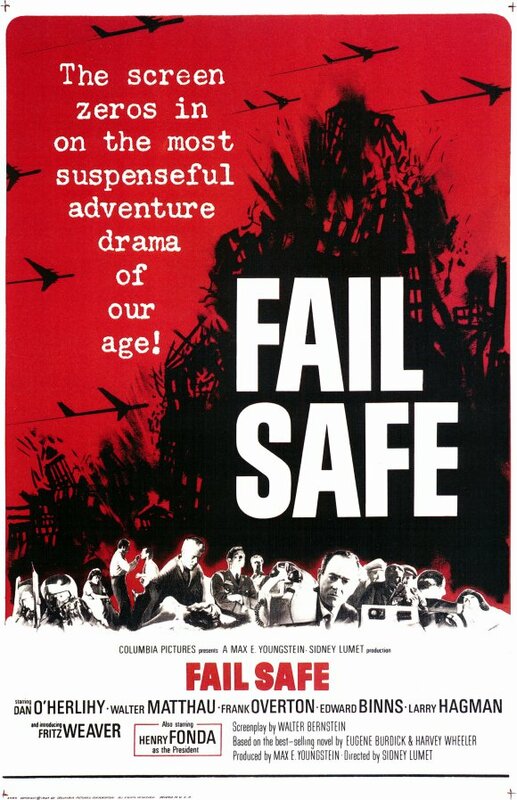 When I first started watching Fail-Safe, I thought I had grabbed the wrong movie. The movie I was looking for was supposed to be tense, suspenseful and engaging. The movie started abruptly and with unusual special effects that made me wonder what I’d gotten myself into. Once the opening scene was done, the credits had rolled and the story had stopped jumping, everything started to look better. This isn’t a movie that changes locales with sweeping scenery and fancy title overlays – it’s abrupt, and similar to the content of the film, it means business. If you can get past that and wait for the actual film to start, I promise it’s worth it. One of my favourite aspects of Sidney Lumet’s directing of 12 Angry Men is used again here. Because the film is shot in black and white, he’s very conscious of two things: (1) the lighting and (2) the way he sets up his shots. One of my favourite shots in the film, and was filmed so well that it stands out in my mind, is when the President, in this brightly lit room, has to answer the call of the Soviet leader, at a time in the film when it doesn’t look very optimistic. For the first and only time in the film, the President’s face is completely in shadow, and stays that way until he forces himself into the light towards the middle of the conversation. Lumet knows how he wants things to look, and he sets up the shots and the actors to reflect the action, something that can easily be missed in today’s movies. As the tension and suspense grows, the shots become closer, tighter. Cuts between scenes become quicker. Every aspect of filmmaking is accounted for in this film. Lumet's directing and Fonda's acting make for some of the film's most memorable scenes. The acting especially makes it worth watching. Walter Matthau, who I’ve usually seen in comedic roles, is exceptional here as a war-hungry political professor. 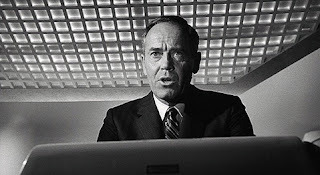 Henry Fonda, a Lumet favourite, is excellent in his role as the President, playing him with a president-next-door kind of appeal that you have to see to understand. And Frank Overton, who I didn’t know and am glad to be introduced to, is impressive as General Brogan. Everyone works in this film. This is not a happy film, and it goes against the typical conventions that you’ve come to expect from your typical war film, or Hollywood production in general. I would watch it again simply for the excellent cinematography, and to figure out whether or not there is any music anywhere in the film. I don’t recall any, and I’d like to figure out if the music was so subtle and the plot so riveting that I didn’t notice, or if there wasn’t any at all. Although, the story was so strong and the dilemma so striking that I wouldn’t have noticed if a band was playing in the same room as me anyway. It was that good. Copyright 2009 Nipissing University Film Collection. All rights reserved.